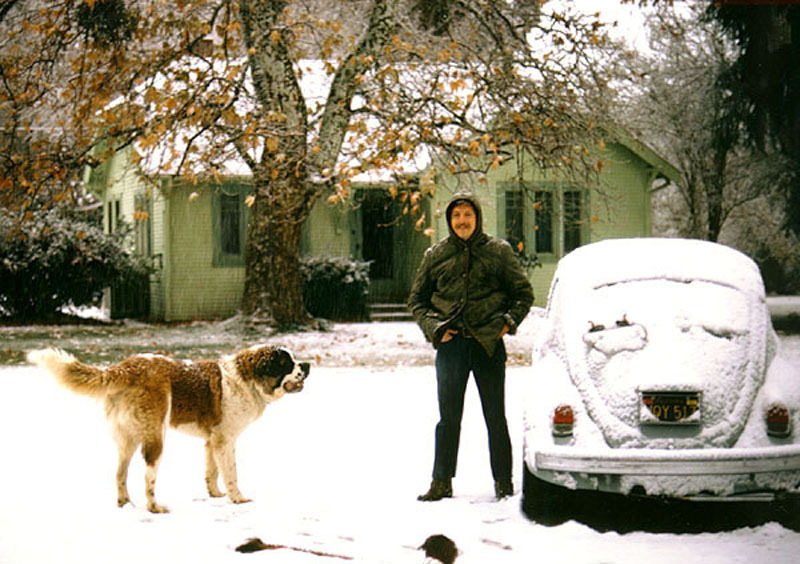 Bruce Carter, occupant, in front of the Edison house during the snow of Jan. 3-4, 1974, when the house stood on the south side of Magic Mountain Parkway in Valencia (adjacent to "Edison Curve"). This house was one of a group of cottages built by the Southern California Edison Company to house employees in 1919 when the Edison substation in Newhall opened. The house was moved west of Saugus in 1925 when the "new" substation was completed, and five other homes were built of identical design. Assistant Edison Patrolman Raymond Starbard occupied it and was credited as being the first to spread the alarm of the 1928 St. Francis Dam disaster. The cottages were sold to The Newhall Land and Farming Co. on Jan. 17, 1972. The cottage was donated to the Santa Clarita Valley Historical Society and moved to Heritage Junction on Jan. 18, 1989. The other Edison houses were burned by the Los Angeles County Fire Department as a training exercise. Architecturally significant, not only for its Swiss-Germanic style, but for being unmodified, this single family residence has a shingled, gabled roof, clapboard siding and hardwood floors. We would like to thank your staff for the personal tour of the Edison House during our recent visit. It brought back many memories of our early life together when we resided at 25252 Magic Mountain Parkway. We lived in our Edison house from the time NL&F acquired them in 1971 [sic] through the summer of 1974. I have enclosed three photos that show the exterior of our home during the winter of 1973-74. Note that strange white stuff on everything! Thanks again for your kindness, and good luck with your ambitious restoration efforts at Heritage Junction Historical Park. BC1974a: 19200 dpi jpeg from smaller jpeg.